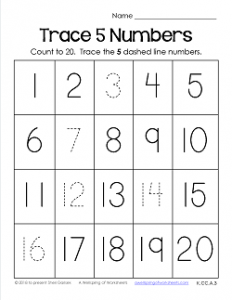 This is just a beginner worksheet for tracing numbers 1-20. Kids can count all the way to 20, but trace 5 of the numbers. Here’s an idea! Trace the numbers in rainbow colors. Can also be used for differentiated learning targeting kids at this particular skill level.